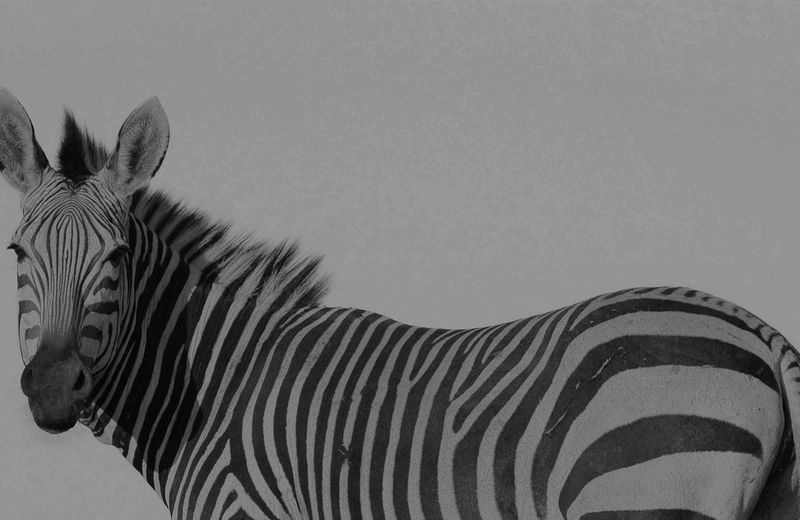 This chapter provides an overview of trade in CITES-listed species reported by EU Member States and candidate countries in 2013. The importance of the EU as an exporting market continues to increase, with the EU reporting more than twice the number of export transactions as import transactions in 2013. Live plants were the most highly traded commodity by the EU; the majority of live plants exported were artificially propagated, while the majority of imports were wild-sourced. The sections below focus initially on numbers of trade transactions recorded within annual reports, followed by an overview of trade by commodities. The overview of the transactions (i.e. number of shipments in trade) is included in order to provide a broad overview of the character of trade that is uncomplicated by the variety of different commodity types and units of measure reported. However, it is important to note that the number of transactions does not provide any indication of the quantity of items in trade, as a single transaction may vary from one trophy to 500 cubic meters of timber to 10 000 leather products. The analysis of trade in particular commodities therefore focuses on the quantity of items in trade. This chapter considers both direct and indirect trade; throughout the chapter, ‘exports’ refers to both direct exports and re-exports, unless otherwise specified. Number of EU import transactions reported by EU Member States by source, 2004 – 2013. ‘Captive -produced’ includes source ‘C’, ‘A’, ‘D’ and ‘F’; ‘Other’ includes source ‘O’, ‘U’ and trade reported without a source. Proportion of import transactions reported by EU Member States by purpose in 2013. 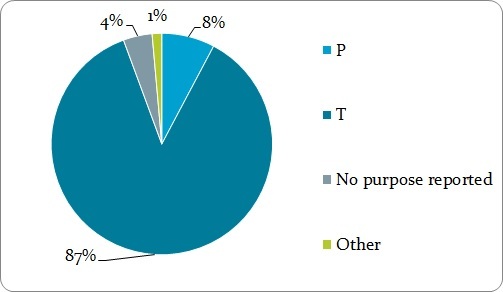 ‘Other’ includes purpose ‘B’, ‘E’, ‘G’, ‘M’, ‘N’, ‘Q’, ‘S’, ‘Z’ and trade reported without a purpose (n=94 955). In 2013, just under 95 000 import transactions were reported by Member States in their annual reports to CITES; as in 2012, the majority of transactions in 2013 (97%) involved either wild-sourced (54%) or captive-bred/artificially propagated commodities (43%) and were for commercial purposes (93%). The total number of import transactions reported by Member States decreased by 7% between 2012 and 2013, which can be primarily attributed to a decrease in transactions involving artificially propagated live plants. A total of 2362 different taxa were imported by Member States in 2013, of which 61% were plants. When quantities are analysed, plants dominate the trade, with live plants, leaves and stems emerging as the top commodities imported by the EU in 2013. Reptile skins were also imported at levels greater than one million units in 2013. Further details on commodities exceeding one million units in 2013 are provided in the sections that follow. Top 10 commodities by group imported by EU Member States in 2013, ordered by quantity (as reported by importers). *↓ signifies decrease in trade in 2013 compared to 2012; ↑ signifies increase in trade in 2013 compared to 2012. In 2013, Member States imported a total of 27 284 033 live plants, the vast majority of which were imported for commercial purposes (>99%). Total imports of live plants decreased by 12% compared to 2012; wild-sourced imports decreased by 10%. 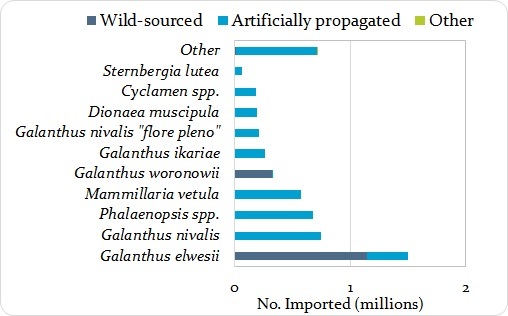 Wild-sourced plants (primarily Galanthus species) accounted for 59% of imports, with artificially propagated plants (sources ‘A’ and ‘D’) comprising the remainder. 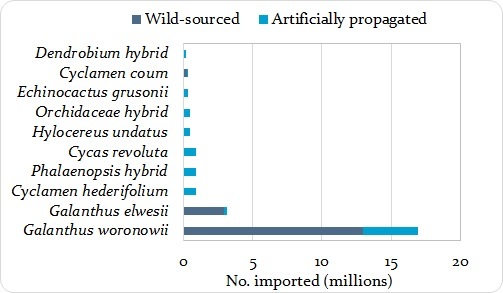 Of both wild-sourced and artificially propagated plants imported, >99% of the taxa involved were Appendix II-listed. Turkey was the main trading partner, accounting for 64% of live plants imported; of these, over half were re-exports originating in Georgia (all G. woronowii). The SRG confirmed a positive opinion for G, woronowii from Georgia on 30/06/2009 (with a quota of 15 millions bulbs) and for Turkey on 16/02/2010. Seventy four per cent of all live plant imports comprised Galanthus spp. of which 79% were wild-sourced. Imports of live plants by EU Member States in 2013, by taxa and source. ‘Artificially propagated’ includes source ‘A’ and ‘D’. 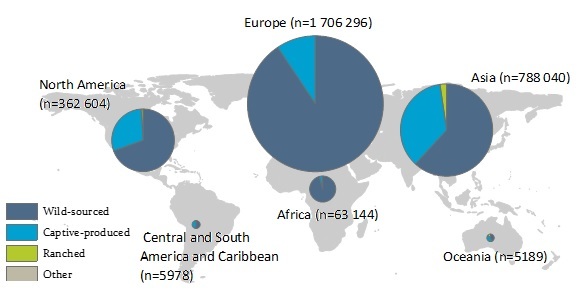 Imports of leaves and stems in 2013 showed similar patterns to 2012 and once again, Cycas revoluta was the top species traded as leaves, accounting for 99% of the roughly 3.8 million leaves imported by the EU in 2013. The vast majority of leaves were artificially propagated and imported by the Netherlands directly from Costa Rica for commercial purposes. Approximately 2.8 million stems were imported by the EU in 2013, the vast majority from the family Cactaceae. All imports were for commercial purposes, with more than 99% artificially propagated; 72% originated in Tanzania. Over 90% of the trade comprised Rhipsalis species. The import of an additional 22 913 kg of stems were reported, of which 96% was artificially propagated Taxus cuspidata. 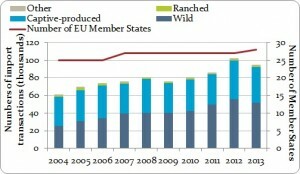 Imports of artificially propagated stems by EU Member States in 2013, by taxa. Excludes 350 wild-sourced stems and trade reported by weight. In 2013, over 1.2 million reptile skins were imported by Member States, a decrease of eight per cent compared to 2012. As in 2012, the majority were wild-sourced (61%) and for commercial purposes (>99%). Half of all skins were imported from Asia; countries in the Americas also represented key trading partners. Singapore and the United States were the top EU trading partners, accounting for 26 and 22 % of imports, respectively. Singapore acts as an entrepôt state for the reptile skin trade and all imports by EU Member States in 2013 from Singapore were indirect trade, with the majority originating in other Asian countries (primarily Viet Nam and Indonesia) and the United States. Imports of reptile skins by EU Member States in 2013, by CITES region of (re-)export and source. ‘Captive-produced’ includes source ‘C’ and ‘D’. ‘Other’ includes source ‘O’ and trade reported without a source. “Europe” excludes EU Member States. 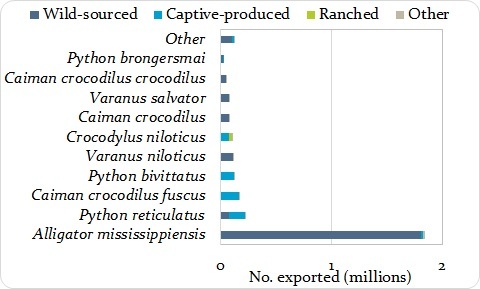 As in the preceding years, Alligator mississippiensis (>99% wild-sourced) was the top taxa in trade, accounting for nearly a third of all trade in skins (Figure 2.6). A. mississippiensis accounted for 99% of wild-sourced trade from North America. 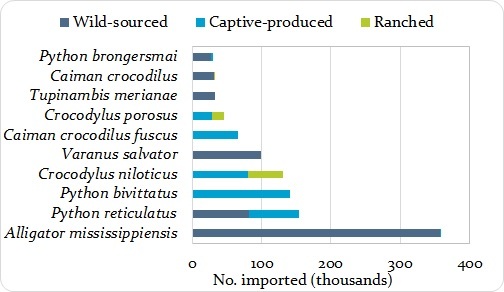 Other species traded at notable levels as wild-sourced were Varanus salvator and Python reticulatus representing 29% and 25% of wild-sourced trade from Asia. Trade in Caiman and Tupinambis species accounted for 95% of wild sourced exports from Central and South America. Reptile taxa imported as skins by EU Member States in 2013 (both directly and indirectly), by source. ‘Captive-produced’ includes source ‘C’ and ‘D’. 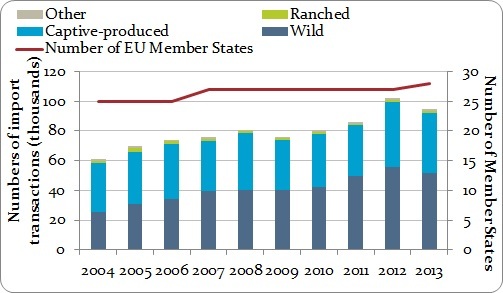 Further details on species imported at notable levels or showing noteworthy trends in 2013 compared with previous years are provided here. Export transactions reported by Member States in 2013 exceeded 200 000 for the first time in the period 2004-2013, continuing an increasing trend seen since 2004. The vast majority of the transactions reported in 2013 (90%) were re-exports. Similar to 2012, transactions involving trade in captive-bred or artificially propagated commodities accounted for 48% of transactions, while 45% of transactions related to wild-sourced trade; the majority of transactions were for commercial purposes (87%). 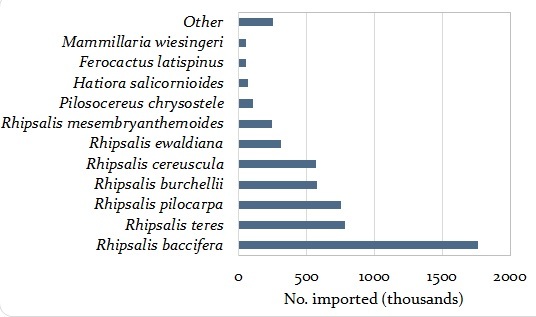 (Re-)exports from Member States in 2013 involved 1886 taxa, of which 45% were plants. Number of EU (re-)export transactions reported by EU Member States by source, 2004-2013. ‘Captive-produced’ includes source ‘A’, ‘C’, ‘D’ and ‘F’; ‘Other’ includes source ‘O’, ‘U’ and no source reported. Proportion of EU (re )export transactions reported by EU Member States by purpose in 2013 (n=202 565). ‘Other’ includes purpose ‘B’, ‘E’, ‘G’, ‘H’, ‘L’, ‘M’, ‘N’, ‘Q’, ‘S’ and ‘Z’. The most highly traded commodities (based on quantities in trade) were live plants, reptile small leather products and medicine from birds. The sections that follow provide further details of trade in commodities (re-)exported at quantities greater than one million units in 2013.
Commodities by group (re-)exported by EU Member States at quantities greater than 100 000 units in 2013, ordered by quantity (as reported by (re-)exporters). *↓ signifies decrease in trade in 2013 compared to 2012; ↑ signifies increase in trade in 2013 compared to 2012. ** No trade in medicine from birds was reported in 2012. 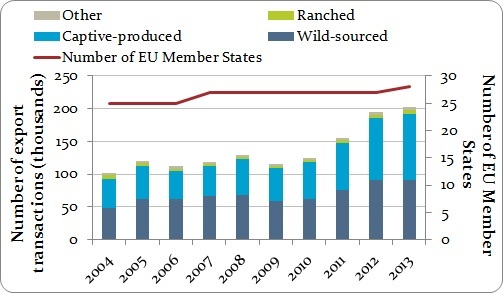 Over 5.4 million live plants were exported by the EU in 2013, primarily for commercial purposes (78%); the majority were artificially propagated (73%; source A and D), with the remainder wild-sourced or reported without a source specified. Virtually all (>99%) of the taxa involved were Appendix II-listed. North America was the main region of destination of exports of live plants from the EU (42%); the United States was the top individual destination country, accounting for 36% of live plants exported from the EU. (Re-)exports of live plants by EU Member States in 2013, by CITES region of destination and source. ‘Artificially propagated’ includes source ‘A’ and ‘D’. “Europe” excludes EU Member States. Other includes source ‘O’ and trade reported without a source specified. The main EU exporter of live plants was the Netherlands (84%). Direct exports from EU Member States comprised 67% of all exports; 97% of EU re-exports originated in Turkey. Fifty-six per cent of live plants exported comprised Galanthus spp., of which 43% were wild-sourced. Plant taxa (re-)exported as live plants from EU Member States in 2013, by source. Source ‘Other’ includes pre-Convention and trade reported without a source. Over 2.9 million small leather products were exported by the EU in 2013, of which 79% were wild-sourced and the vast majority (99%) traded for commercial purposes. Alligator mississippiensis accounted for 63% of exports, of which 98% were wild-sourced and originated in the United States. 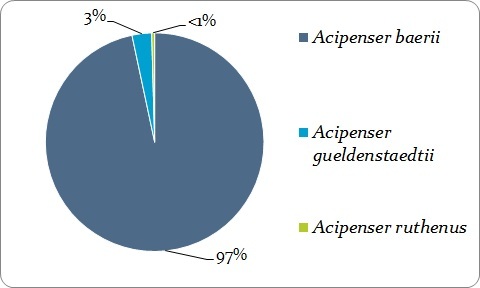 Reptile species (re-)exported as small leather products by the EU in 2013, by taxa. ‘Captive-produced’ includes source ‘C’, ‘D’ and ‘F’. Other includes source ‘U’, ‘O’ and trade reported without a source specified. The main destination region was Europe (excluding EU Member States; primarily Switzerland), accounting for 58% of trade. Virtually all of the trade comprised re-exports; the United States was the main origin country. In 2013, over 2.9 million units of medicine containing captive-bred Cairina moschata were exported from France, all of which were exported for commercial purposes. The main destination countries were Russia (44%) and the United States (27%). This was the first year when trade in this commodity was reported from the EU; further consultation with France confirmed that these records represent trade in homeopathic medicines, with units representing number of drug packets. Over 1.7 million live fish eggs were exported by the EU in 2013; all were captive-bred sturgeon eggs and exported directly from the EU for commercial purposes. 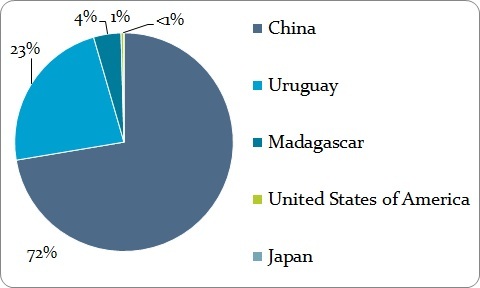 The majority of live fish eggs were exported to Asia; 72% were exported from France to China. Trade in live fish eggs was limited to three sturgeon species: Siberian Sturgeon Acipenser baerii, Russian Sturgeon A. gueldenstaedtii and Sterlet Sturgeon A. ruthenus, with the vast majority (97%) A. baerii. Exports of live fish eggs were also reported by weight (97 kg). Percentage of EU exports of live fish eggs in 2013, by species (n=1 727 500). Excludes trade reported by weight. Further details on commodities and species exported at high volumes in 2013 are provided here. Over 3000 import transactions and approximately 1000 export transactions were reported by the four candidate countries who submitted annual reports in 2013. 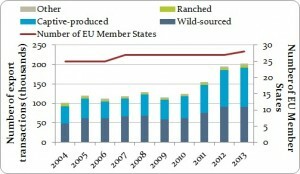 Numbers of both import and export transactions increased over the period 2004-2013, with export transactions in 2013 increasing almost 60% relative to 2012, which can primarily be attributed to increasing exports of garments and small leather products, largely involving Python reticulatus, by Turkey. The trend in import transactions over 2004-2013 can primarily be attributed to increasing imports of reptile leather products, primarily involving Python bivittatus, P. reticulatus and Alligator mississippiensis, by Turkey. Number of import (left) and (re-)export (right) transactions reported by the countries that were EU candidates in 2013, by source, 2004-2013. ‘Captive-produced’ includes sources ‘A’, ‘C’, ‘D’ and ‘F’. ‘Other’ includes sources ‘O’, ‘U’ and trade reported without a source. Annual reports had not been received from Iceland for 2012 or 2013 at the time of data extraction and analysis (May 2015). The majority of import and export transactions in 2013 were for commercial purposes; over half involved wild-sourced commodities (56% of import transactions and 61% of export transactions). The top importer and exporter in 2013 was Turkey (95% of import transactions and 86% of export transactions). 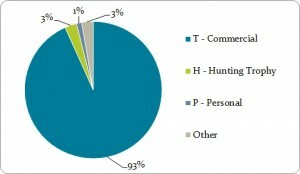 In contrast with EU-reported imports, the majority of candidate country imports in 2013 involved animal rather than plant commodities; the top commodities imported were mammal and reptile skins, of which the majority were wild-sourced (98% and 68%, respectively). Commodities imported by candidate countries at quantities greater than 1000 units in 2013, ordered by quantity (as reported by importers). Iceland’s annual report for 2013 had not been received at time of analysis (May 2015). The most highly exported commodities by candidate countries in 2013 were live plants, with over 26 million plants exported; the majority were wild-sourced (75%). All live plants were exported by Turkey to the Netherlands for commercial purposes; 56% originated in Georgia and the remainder were exported directly. Relatively smaller quantities of mammal, reptile and fish commodities were also reported exported by Turkey and FYR Macedonia. Additional details on imports and exports of candidate countries can be found here and here.